Per the usual in threads where K-A contributes, the thread descends into a discussion tangential at best to what the OP is asking. Talk of grip not affecting cornering feel, "floaty" when we're talking about body roll, etc, etc, etc., ad nauseum. Typical when people assume they are more knowledgeable than they actually are. So quick to pontificate and accuse other of drinking the kool-aid, and then come back with a totally different opinion. OP, there are spring/shock as well as coilover options out there if you do a quick search. They will definitely reduce body roll in corners over the comfort suspension. Have you tried looking online? I have no experience with springs only on the W212, but have KW V1 coilovers. They make the ride much sportier and are a touch too harsh if I'm honest. In my experience with the KW v1's, the car doesn't handle as well as the S5 and has a harsher ride quality as well. Feels like too much rebound damping for the street. If I had to do it over, I'd go with KW V3's or Bilsteiin pss10's if they have actually become available now, even though they are about twice as much in cost. Also, I'd check the alignment on your car. You can throw parts at the car, but if the alignment specs are not up to snuff for what you want, it's not going to handle well. You don't have to go with the stock specs, they are very conservative as far as handling goes. Last edited by brauhaus313; 04-01-2013 at 06:43 AM. 1. I bought a PREOWNED 2012 E550 that was 4 months old with 6k miles. I am the second owner. 2. The first owner special ordered the car. 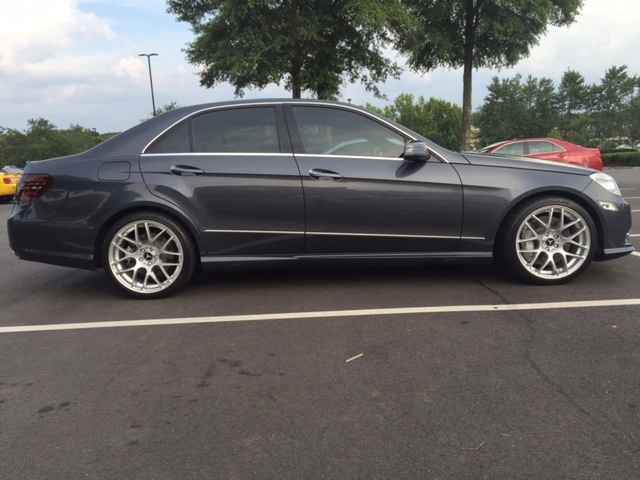 He specifically ordered the car with the COMFORT suspension that is standard on the E350. The car does NOT have the Stock E550 suspension, or AIRMATIC. 3. Where I live, this was the only preowned E550 with the equipment I wanted within 300 miles. The first owner was a smoker and they sold me the car for 20k under the original sticker on Dec 30th (love end of year bargaining). My S5 was not reliable and about to take another residual hit in value. I couldn't mess around. Based on what I am reading in this thread, it may be best for me to test drive another preowned E550 with the stock sport suspension to feel the difference before deciding to go aftermarket or just watch the forum for a E550 stock suspension setup coming off another car. When I say "It just doesn't feel safe", I mean that with the E350 Comfort suspension is unnerving with the extra ride height and extra body roll. The tires are gripping, but coming from a car with very minimal body roll (Audi S5), it is a little hairy to take a corner at the same speed in the E550. Obviously they are different cars, and I can't expect them to both perform the same, it is just different and I originally thought it wouldn't bother me. I was wrong. It does bother me. Wow. so you're talking about a Comfort suspension and not even the Sport suspension. To be honest I wish you would have come here and asked about body-roll before buying the car. I for one could have told you that especially considering my experiences with the "Sport" suspension, if body-roll is in any way, shape or form an issue to you, you should run away from an E-Class on comfort suspension. That ultra smooth, serene and floaty ride you should be feeling on straight surfaces are basically why you're sacrificing any tightness on corners. I'm sure you can throw lots of suspension components to wake it up in that respect, however considering it's the COMFORT suspension I'd probably advise to stay away unless you're planning on throwing lots of $$$$ into it. Changing anything to make it "sportier" would certainly throw off the balance engineered into the suspension by the manufacturer therefore sacrificing said serenity on straight surfaces, and of course being a Comfort suspension car, there would be a lot more to change than the Sport suspension cars, especially if you want to retain any kind of balance. It is quite nice on the highway. On a positive note, it gives me the thrill of pushing the car to the edge without breaking too many speed limits. Back when every manufacturer made one version of every model, there was an attempt by manufactures to choose compromises that made the car fit what most people were looking for. Now, with so many versions of a model, there is a real possibility that you can end up very disappointed with what you have purchased. I can commiserate with you about the soft "comfort" suspension. Half the reason we traded our E350 was how far it was from a "sports sedan". Even S class sedans feel more tied down. With the comfort suspension, not only is the car too softly sprung and under shocked, but what was as bad was the poor steering response and on-center play. I even had our local Mercedes service manager go over it with me. Basically the standard or comfort suspension is suitable for a Buick......or Lexus. W210's AMG descriptions are pretty spot on. The original C63 track suspension was so stiff that the it was reportedly slower than the base suspension around the N'ring. Ours was brutal in low speed use, not to mention pot holes or speed bumps. BMW still seems to have that part figured out a bit better. The W212 E63 I drove at Road Atlanta didn't feel rewarding to drive. It didn't feel balanced. Just a big engine and lots of (air) spring to try to control the mass. A four door car that beats up the passengers. If you like your E550 otherwise and wish to salvage the situation , I would start with O.E. sport suspension shocks or the aftermarket equivalent. I would hesitate to go to coil-over or H&R springs. My experience is that they make sure you can feel a "seat of the pants" difference, and end up too stiff. Sway bar changes can help too, but try to stay with something close to the sport suspension rather than big aftermarket bars. Lastly, 18" wheels (If you don't have them) and more performance oriented tires will help steering response without killing the ride. I didn't know that buyers could custom order the comfort suspension on the E550. I wonder.... is that still true for the 2014 E550 4Matic sedans? Probably. Any salesmen wants a sale and MB is desperate to keep up the numbers. I have been checking around to see what options are out there to lower by car by 1/2" just to remove the space between the tire and the body to make it look better. Unfortunately the two answers I've received are 1) cut the springs (which I would never do) and 2) nobody makes a kit for it and I'd have to buy springs and struts which after installation would run around $3k which I'm not happy about since it usually only costs around $1200 to lower any other car. Does anyone know of any other options besides what I mentioned above? I thought Renntech sold equipment for lowering for about 1k? you can always go with links $130 on ebay , you can adjust it how u want it. Slightly off subject but---Have 2015 ML250. Had H&R lowering springs installed. Dropped front end 40 mm---rear 45mm. You would probably not be as aggressive but there was a large gap between the body & the tires in an SUV. Little diff in the ride but noticeable improvement in handling & looks. . H&R springs are @ progressive rate. Bought mine from the UK. Total about $400 including air fgt. Another $400 for installation. Very plsd with my $800 investment. H&R seem to have springs for almost every application. No need to chg shocks. I was advised to NEVER cut springs. Last edited by greasykid; 08-01-2015 at 02:45 PM. This has been a great discussion. I just bought a 2010 CPO E350 with comfort suspension. It's mostly my wife's car. Before she had a C320 Sport 4-matic. WOW !!! What a difference. The C320 felt like it was on rails. It was reasonably comfortable, but it held the road like glue. Minimal body roll. But she had to have an E-class. The feeling of driving her E350 is just that described in these posts : floaty, body roll, and comfortable. But driving it hard. Just won't happen. I just can't see how any aftermarket combination could help short of rebuilding the entire suspension. And in such case, better to sell the car and buy what you want. It's my wife's car, and she doesn't seem to mind. It suits her driving style. And given the horrible road surfaces we have here in NY, I feel like I'm subjecting myself to less torture in the Comfort-class E350 !! I use the Sports Mode from time to time and it definitely helps when taking turns at high speed. I didn't know until I read this thread that all E550s didn't come with air suspension. Honestly, I would not have even thought to ask before I purchased. It's not something that I would've noticed during a brief test drive either. If you have an E550 you may be equipped with airmatic. If so, get lowering links. I lowered mine 2 inches with 3 different height setting now. After lowering an AirMatic does one have to reset the TOE?